The Young Marines is a youth education and service programs for boys and girls, ages 8 through completion of high school. The Young Marines promotes the mental, moral, and physical development of its members. The program focuses on character building, leadership, and promotes a healthy, drug-free lifestyle. The Young Marines is the official youth program of the U.S. Marine Corps and the focal point for the Marine Corps’ Youth Drug Demand Reduction efforts. The Young Marines is open to all youth ages 8 through completion of high school. The only membership requirement is that the youth must be in good standing at school. Since the Young Marines’ humble beginnings, in 1958, with one unit and a handful of boys, the organization has grown to over 240 units with 10,000 youth and 3,000 adult volunteers in 46 states, the District of Columbia, and, Germany, Japan and affiliates in a host of other countries. Upon joining a local Young Marine unit, youth undergo an orientation program, affectionately called “Recruit Training.” The youth learn general subjects such as history, customs and courtesies, close order drill, physical fitness, and military rank structure. After graduating from Young Marine “Recruit Training”, the youth have the opportunity to learn more new skills, earn rank, wear the Young Marine uniform and work toward ribbon awards. Young Marines earn ribbons for achievement in areas such as leadership, community service, swimming, academic excellence, first aid and drug resistance education. Young Marine units are community-based programs lead by dedicated adult volunteers. Many of these volunteers are former, retired, active duty, or reserve Marines who believe passionately that the values they learned as Marines had a positive affect on them. It is through these caring adults, military and civilian, that our Young Marines learn the inner values of Honor, Courage and Commitment. They volunteer their time and effort to pass these values on to the youth in their respective communities before other destructive influences take root. Adult volunteers are individually screened by the National Headquarters based on background information and recommendations provided with each person's registration. Prior military experience is Not required to become a volunteer with the Young Marines. During the summer months, Young Marines have the opportunity to attend the Young Marines National Summer Programs of: Adventures, Challenges, Encampments, and Schools (SPACES). Schools consist of leadership courses. Adventures, have a historical emphasis and are designed with the younger child in mind. In contrast, older Young Marines can participate in Challenges. Challenges consist of training in areas such as survival skills, wilderness training, and water-based activities. Young Marine Encampments provide the opportunity for Young Marines of all ages to gather together and train as a large unit of up to 700 youth at a time. Over 3,000 Young Marines participate in the SPACES programs each year. 1. General. In response to the United States’ substantial illicit drug problem, Congress mandated in section 1045 of the National Defense Authorization Act for Fiscal Year 1993 that the Secretary of Defense “conduct a pilot outreach program to reduce the demand for illegal drugs. The program shall include outreach activities by the active and reserve components of the Armed Forces and shall focus primarily on youths in general and inner-city youths in particular.” The Young Marines program was one of 12 youth programs funded in support of the Act. The Young Marines continue to receive federal funding in support of the drug demand reduction program. 2. Policy. Young Marine Units are required to provide a minimum of three (3) hours of drug prevention/ drug resistance instruction each quarter (every three months) each operating year. 3. Responsibility. Working with Young Marines is both challenging and rewarding. As challenging as they are, they seek our attention and approval. Keep in mind that we are helping them become adults who will become parents, caregivers, employees, friends, neighbors, followers, leaders, and responsible members of the community. We do this by: a. Advocating a healthy, drug-free lifestyle through personal example. Providing continual drug prevention education using community resources. Providing a safe, clean and nurturing environment in your meeting places and activities. Encouraging open communication when they are troubled or uncertain. 4. Commitment. An effective drug demand reduction program is an essential part of the Young Marines Program. The value of the program is limited only by your imagination and your commitment to reducing the abuse of alcohol, tobacco, and drugs by youth. Registered Adults must strive to be the positive role models expected of them. Young Marines look to them for guidance, strength, and protection, yet they want room to grow, experience life, push the limits, and be more independent. Most Young Marines are conflicted between wanting greater independence and needing greater security. What they do not receive from adults they will seek from peers. Be available, do not smother, respect their space, but be straight, firm, and open—remember to listen. Young Marines may talk more openly about sensitive topics with someone who is not their parent or guardian. The Young Marines is the proud two-time recipient of the Department of Defense’s Fulcrum Shield Award for Excellence in Youth Anti-Drug Programs. The award recognizes military-affiliated youth organizations around the world that have made concerted efforts at spreading the anti-drug messages throughout their communities. The first award was presented to the Young Marines National Headquarters and the second to the Bakersfield Young Marine unit in California. 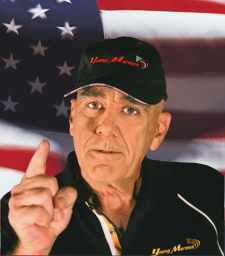 As a Golden Globe nominee and Boston Society of Film Critics Award-winner for Best Supporting Actor in director Stanley Kubrick's "Full Metal Jacket", R. Lee Ermey is one of the most successful and talented actors working in film and television today. His numerous roles in feature film include: "Switchback", starring opposite Dennis Quaid and Danny Glover, "Dead Man Walking", "Seven", "Leaving Las Vegas", "Murder In The First", "Life", "The Frighteners" and "Sommersby" as well as his critically acclaimed role opposite Jared Leto in "Prefontaine". He continues doing numerous voice over roles which span from "The Simpsons" to "Toy Story" (1 and 2). Chester, the puppy bulldog, is the Young Marines ofﬁcial mascot. Chester enjoys all the beneﬁts of Young Marine membership such as the opportunity to earn rank and ribbons, wear the Young Marine uniform, and a free subscription to the Young Marine Esprit magazine. Chester sometimes even makes guest appearances at unit meetings, graduations, and training conferences.